The unique Kelley School of Business Evening MBA allows students to earn their MBA in 24 months, with an added benefit of both in-person and online classes. In total, the program consists of 33 core credit hours, six credit hours dedicated to executive skills, and 15 hours of elective courses. In total, students are required to complete 54 credit hours of work. Classes are usually held twice per week: one week on campus, one week online, both in the evening between the hours of 6-9 p.m.
Students have the option to begin the program in either August or December. Either time frame begins with an orientation and business simulation, as well as two electives fulfilling the executive skills requirement. The major differences, however, come down to the time-frame of events. Students that start in August finish their degree during a summer semester featuring their required capstone project, while students who start in December complete their capstone in the semester prior to their final one. After completing the requisite core courses accounting primer, students begin elective coursework, which consists of six credit hours per semester. Four majors are offered as part of the Evening MBA program: management and entrepreneurship; finance; marketing; and supply chain management. The average age of the current Kelley Evening MBA class is 31-years old. Enrolled students earned a GMAT of 633 and an undergraduate GPA of 3.29. The average work experience is 7.6 years. An estimated 288 students are enrolled in the program, with 17 percent female students, 19.1 percent U.S. minority students, and 28.1 percent international students. 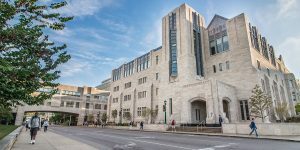 The annual tuition rate for Indiana Kelley School of Business Evening MBA students is $819.37 per credit hour in Indiana, and $1,456.56 out-of-state. In total, over the span of 54 credits, the in-state total comes to $44,254.98, and the out-of-state tuition total is $78,654.24. Typical fees are $325 per quarter and primers are $200 per course. Cost of materials is not included in these estimates. A $500 non-refundable deposit is required to hold a spot in the class upon enrollment. Merit-based scholarships are awarded to applicants who have earned a minimum GMAT scored of 700 (or a GRE equivalent). U.S. students are eligible for both public and private loans, while international students are generally offered private loans. • A complete IUPUI application and a Kelley Evening MBA application.